It is family run eatery, located in a small roadside shack on a busy street in Worcester. 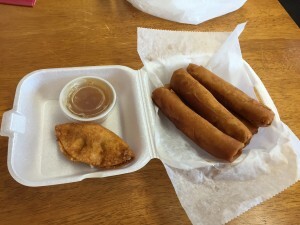 The Eggroll lady and fish shack offers a small menu, primarily composed of fried items, as you would expect. I was the only customer at 2 PM on a Thursday afternoon. There is only counter service, but there are five high-top tables for two available to sit at. I ordered a small order of the famous eggrolls ($6 for five, $11 for 12). Phuong Lam, the eggroll lady herself, was there and asked if I wanted some crab Rangoon, bragging how delicious they are. I told her no, I was sure they were great, but not today. She insisted that I should try one and threw a complimentary Rangoon in to my order. My order came out hot and crispy - the kind of hot that burns the roof of your mouth because you are not patient enough to wait for it to cool. The eggrolls themselves are long and skinny, filled with chicken, vermicelli noodles and shredded vegetables. The eggrolls were less flavorful than I expected; I think the ratio of filling to exterior was off. The rolls really be thicker so that the flavor of the filling shines. They also advertise "special homemade duck sauce" - it was too sweet and tasted of applesauce. If you call yourself and your restaurant, the eggroll lady, your eggrolls better be pretty damn good. Sadly, these failed to live up to expectations. The crab Rangoon was also fried correctly; Within the crispy wonton wrapper was a mixture of cream cheese and supposedly real crab. I did not detect any crab, but the filling seemed to have ricotta and specks of some unknown herb mixed in. It was better than your regular Chinese-American restaurant crab Rangoon. Needless to say, I don't recommend a special trip to Worcester for these eggrolls. But if you are craving some fried food and are nearby, I would try the carb rangoons. Keep in mind, they are only open Thursday through Sunday.